If you have ever wondered how guitarists in Heavy Metal bands chillout, then you should check out Insomnia (39'41") by Leila Abdul-Rauf. Here this restless musical traveler asserts a separate artistic identity. Abdul-Rauf's part as vocalist and guitarist in Hammers of Misfortune finds the sharp edge of the world brushing up against her. In a test of her range the texturally based Insomnia reveals a more quiescent and cerebral plane. Bringing a kind of wondrous, somnolent peculiarity to our minds, it breathes with life. Together we wander through 11 shadowland interludes. The vast designs are intimate and exact - with a self-generated glow radiating beneath the chill shadow of a despondent beauty. 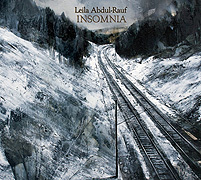 The brief musical visions on Insomnia are charged by Abdul-Rauf's heady, heavy mental mechanics. Winding e-bow tones, coursing synths, dense electric guitar washes, otherworldly vocals, echoing violin and arresting trumpet advance in turn beneath a cavernous reverberation. Subtle modifications of intensity make the musical performances alive and more interesting - as Insomnia asks for more of the listener than does the average atmospheric release. From the vague wonder of a dark room, to the howling plains of nowhere, this penetrating psychological drama is just as useful for thoughtful introspection as it is for forgetting oneself entirely. The music swells with an urgent, but uncertain meaning. A 21st century tragedienne of Ambient Music, Abdul-Rauf provides: harmony, dissonance, resolution - amidst a story, a song, a life. Some will find it profoundly strange, while others... strangely profound. 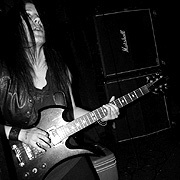 Abdul-Rauf's musical reflective transcendence may seem out of step with her more kinetic Metal Music peers. Consequently, Insomnia should pose a challenge to those seeking easy answers, but it is a challenge well worth taking.